Please send me your questions! I will do my best to answer them. Where can I buy Kimba videos/DVDs (in the US/North America)? Where can I buy Kimba videos in PAL format? Do any Kimba DVDs have the option of watching the series in the original Japanese, with English subtitles? Where can I buy Kimba collectibles/t-shirts/other stuff? Can you get Kimba back on TV? I'm watching the Kimba tapes in order, but it seems like the episodes are out of order. What's going on? What are the different TV series and movies that have been made of Kimba? Why do the characters' names change in the different series and movies? Like first, he's "Kimba" then, he's "Leo"--why? I heard of a "1993 dub" or a "re-dubbed Kimba" series or a "Canadian Kimba" series. What are these all about? What is that weird pig-face thing that pops-up sometimes in Kimba? In the Jungle Emperor Leo movie, why does Tomy the gazelle have a hat? Did he find it somewhere? What about the similarities between Kimba and the Lion King? So what does the Lion King connection mean to us? Where can I buy Kimba DVDs or videos (in the US/North America)? The Australian company Madman Anime has released the complete original Kimba series in English on DVD. Check Madman Anime for info. If you're looking for VHS tapes, unfortunately, I don't know of any currently being made anywhere. 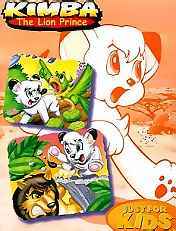 One possible way to find PAL VHS tapes of Kimba is to keep on checking ebay for old tapes from Australia (which will be the 1993 re-dubbed version) or from the UK (which will be the original 1966 dub). The UK tapes are much harder to find: There were two Kimba videos made in the UK in the 1980s, and used copies show up on ebay on rare occasions. "Volume 1", also known as "Son of Caesar" (CBS EVV 2001), contains the episodes "Go, White Lion! ", "Jungle Thief", "Dangerous Journey", and "Great Caesar's Ghost". "Volume 2" (CBS EVV 2002) contains the episodes "Journey Into Time", "Restaurant Trouble", "The Bad Baboon", and "The Wind In The Desert". I'm told that most VCRs and TVs in PAL countries can play US (NTSC format) tapes anyway, so you might want to go for the US VHS tapes which are still available. In the Kimba Ultra Edition DVD set--both the US and the Australian sets--the first episode is presented in its original Japanese form, with English subtitles. This is the only subtitled episode I am aware of. The White Lion Shop now has a listing of genuine vintage Kimba collectibles, very rare and hard to find, that you can buy now. Plus, my Links page has links to all the currently-made items that are available online, that I know about. That is up to the individual TV stations and TV networks. If you want to see Kimba on TV again, write to your favorite channels and tell them so! The original TV run of Kimba in the U.S was shaped by the way the TV syndication market worked. Osamu Tezuka had his story, which he wanted to unfold across time as each episode was shown each week in Japan. NBC Enterprises knew that they were going to take these episodes and physically ship them to TV stations all over the country, where they would have no control over how they were shown. So they tried to engineer the English scripts to make each episode self-sufficient, and then they actually sabotaged the continuity of the shows by creating new sequence numbers for each episode--putting them into a new sequence that had nothing to do with Tezuka's intentions. In spite of this, it's quite obvious to anyone watching Kimba that this is actually a continuing, evolving story. Kimba is a youngster throughout the entire series, but if you watch the shows in the order that Tezuka made them, you can see Kimba growing up. That is one of the coolest details of the series--being able to see Kimba grow both physically and emotionally as each episode passes. Fans have tried to reconstruct the original sequence, with some disagreement. When The Right Stuf made their VHS tapes, they followed the only official document available, NBC Enterprise's episode guide. But the original order in which the shows were broadcast is known and available (and this order was used to make the Kimba DVDs). My episode guide is in the original Japanese order, and you can use it to watch your Kimba tapes in a more satisfying sequence. The real Kimba--the first TV series. All the other Kimba shows. Why do the same characters have different names in the different series and movies? First, he's "Kimba" then, he's "Leo"--why? The white lion was always called Leo in Japan, where the story originated. When Kimba was brought to the US, Fred Ladd's team thought that Leo was too ordinary a name, and came up with the name Kimba as well as new names for all the other characters. (See also the page with the full history of the original Kimba series.) But the same group of people did not work on any other Kimba show. When a different company translated the "Leo the Lion" show 18 years later, the question of who owned the name "Kimba" prevented them from using the same name. Also, the Kimba TV series was not available in 1984, so they wouldn't have been able to research the names that were used for all the other characters. It was much easier to use the original Japanese names for all the characters in the show, even though it made for a confusing situation. Later productions, such as the 1993 dub and the English version of the 1997 movie, also used the Japanese names for nearly every character. I heard of a "1993 dub", or a "re-dubbed Kimba" series or a "Canadian Kimba" series. What are these all about? When you hear of a "re-dubbed" or "Canadian" version of Kimba, these refer a new (1993) English-dubbed version of the original Kimba series--this is what's on TV right now. The first English version of Kimba was not available in North America after 1978. NBC's contract ended in 1978, Mushi Productions went bankrupt, and the battle over the rights to the English-language version was in the courts for a very long time. A Canadian company emerged from the courts in 1993 with the rights to sell Kimba to TV stations around the world. They could not use the U.S.-made soundtracks from 1966, so they created new English soundtracks for the shows; that's why these are referred to as "re-dubbed". This new version has its good points and its bad points. They gave us a more faithful translation of the Japanese scripts. While this can be funny at times (the lion known as Claw becomes "King Bubu"--not exactly a fear-inspiring name) it reveals even more depth to Tezuka's story: Caesar (Panja) would steal the cattle from the village to feed the predators in the jungle in order to keep the wild prey animals safe. This makes Kimba's desire to have ALL animals live in harmony with people even more radical and brave. On the bad side, they threw out the original music along with the Japanese voices. Their new music, played on a synthesizer, cannot compare to Isao Tomita's wonderful symphonic music. What is that weird pig-face thing that pops up sometimes in Kimba? This is seen in many of Tezuka's anime and manga, such as Astro Boy, Amazing 3 and, of course, Kimba. This "pig thing" is a "hyoutan-tsugi" or sewed gourd. It looks like a pig-faced patchwork creature that sometimes puffs out smoke. Tezuka wanted to keep his works cartoony, so when serious events happened he would throw in a gourd, have one bounce off the hero's head, have a bunch of them rain down from the sky, or even have a character's face turn into one, to cool things down. It wasn't meant to be a character, just a joke. Sometimes called a gourdski, the use of it became a big hit with Tezuka's fans. Tezuka came up with it when he was young; he based it on one of his little sister's drawings. That's a good question--Tomy was called Bucky Deer in the first Kimba TV series, and there he has no hat. In the Jungle Emperor movie, he has the hat but it's never explained. The hat originally appeared in the manga, in a story that took place long before the time frame of the movie. Kimba was in Africa along with Roger and Mary, so apparently the hat was something they had with them. Kimba gave the hat to Tomy after the animals defeated a bunch of native hunters, as a mark of distinction--Tomy was to be in charge of obtaining food for the animals. To see that page from the manga, click on the picture at the right. While the main point of this site is to celebrate Kimba and the heart and soul that drove the story and won Kimba a permanent place in people's hearts all over the world, this is an issue that won't go away. The derivative nature of The Lion King was immediately obvious to me and many others. The reason there is a controversy is that the relationship is officially denied. So, it bears looking into. The more I investigated, the more I learned that there is a real relationship between the two productions. It is more than a coincidence, more than a tacit tribute. It appears that The Lion King was intended to be a remake of Kimba The White Lion. The evidence ranges from the very close situational similarities, to the nature of the litigation that has been filed, to the words from people on the inside at the Disney company. Have a look for yourself. Missing from The Lion King is what, for me, was the single greatest element in Kimba the White Lion: the relationship between humans and animals. This is so vital in our world. And yet, what do I hear within the words of Lion King fans? They identify with the lions in the movie. They bring that human-animal connection to the movie themselves. If, by way of this derivation controversy, Lion King fans discover Kimba The White Lion, and explore this connection further, then it's all good. Kimba The White Lion can exist in the 21st century as The Lion King taken to the next level. Yeah, Kimba came first, but Lion King has better distribution. Kimba's story lines involving the struggle to build strength of character, and the need for ALL life to be part of the great circle--animals AND humans--are great things that most Lion King fans can enjoy. The first time I heard the little white lion say that he needed a way to allow humans to understand animals, my heart jumped for joy. The same thing can still happen for lots of other people, and thanks to The Lion King connection, lots of people now know about Kimba. Something on this page was changed on 21 July 2010.